UC Santa Cruz researchers combined observational and experimental approaches to determine what kind of information is encoded within the vocalizations of male elephant seals. 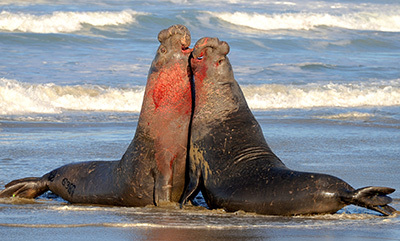 Male elephant seals compete fiercely for access to females during the breeding season, and their violent, bloody fights take a toll on both winners and losers. These battles are relatively rare, however, and a new study shows that the males avoid costly fights by learning the distinctive vocal calls of their rivals. When they recognize the call of another male, they know whether to attack or flee depending on the challenger's status in the dominance hierarchy. Researchers from UC Santa Cruz have been studying the behavior of northern elephant seals at Año Nuevo State Reserve since the late 1960s. The new findings, published August 12 in the journal Royal Society Open Science, come from a long-term study led by graduate student Caroline Casey and research biologist Colleen Reichmuth in collaboration with French experts in bioacoustics and animal signaling systems. "Anybody who's studied elephant seals knows that their vocal communications are important, but we haven't known what information is encoded in the vocalizations," Casey said. "What we found is that these calls are identity signals. Each male has a unique call, and they learn to recognize the calls of their competitors, so they know how to respond during contests." During the breeding season, the beaches at Año Nuevo are crowded and noisy. Males establish their social status initially through physical confrontations, but most of the interactions between males consist of ritualized displays involving loud vocalizations called "clap threats," as well as physical posturing (usually rearing up to show an elevated profile). Sometimes they slam their chests onto the sand to send a seismic signal. High-ranking "alpha" males defend their harems from all challengers, while mid-ranking "beta" males respond to rivals according to their relative social status. "There is a very structured social network among the males in a given location. Although the rate of conflict between males is very high, the rate of actual physical aggression is very low--only about 5 percent of interactions lead to physical contact," said Reichmuth, director of the Pinniped Cognition & Sensory Systems Laboratory at UC Santa Cruz. The researchers recorded the calls made by male elephant seals during challenge displays directed at other males. Then they used acoustic analysis and playback experiments to figure out what is being communicated in those exchanges. They found that males responded aggressively to the calls of subordinate males, but when presented with the call of a dominant rival, they moved quickly away without calling. Males of many species use specialized signals to assess their opponents, and these are often so-called "honest signals" that directly convey information about an individual's size and strength or willingness to fight. For example, a large male might have a louder or longer call than a smaller male. In elephant seals, however, the researchers found that even though some features of the males' calls are associated with size, those features don't predict how competitors will respond. Instead, males recognize the calls of familiar rivals and respond accordingly. To see how males would respond to the calls of unfamiliar rivals, the researchers went to a different rookery, at San Simeon State Park, and played back calls recorded at Año Nuevo. For each of ten mid-ranking males, they played one call from a dominant male and another call from a subordinate male. Instead of attacking or retreating, most males simply sat up and looked toward the speaker. "They either ignored the speaker or seemed hesitant to respond, like they were looking for more information," Casey said. Reichmuth noted that the call of an individual male is not only very distinctive, it is always the same, regardless of the situation. Whether engaged in combat or shooing away a low-ranking male, an individual's call did not vary at all. "It's impressive that they could stay that stable, which tells us how important it is for them to have an identity signal--a special vocal signature," she said. 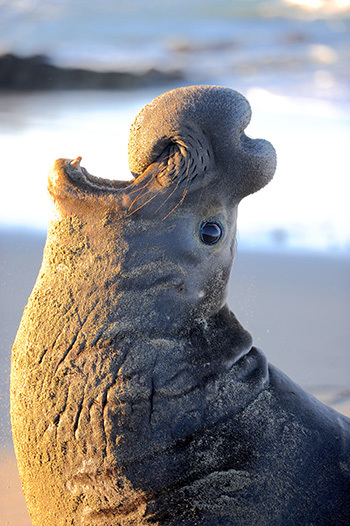 "Elephant seals have a fairly unique system of acoustic communication that is based on identification of familiar individuals and learning of social networks." This communication system is important because it allows the males to conserve their energy and avoid unnecessary fights during a breeding season in which they are fasting for up to three months. The researchers observed individual male elephant seals engaging with as many as 43 opponents over the course of a single breeding season. Sustained fights occurred in less than 2 percent of the interactions and always involved males of similar dominance status that had not fought previously that season. The study required an enormous effort over the course of four breeding seasons to record and mark all the males in the colony, observe their interactions, obtain recordings free of background noise, and conduct playback experiments within the large, dynamic colony. 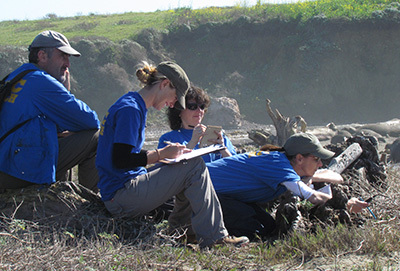 "Many animal behavior studies involve observation and description of patterns of behavior, but doing field experiments is less common," Reichmuth said. "This study is a very thorough attempt to decode animal signaling through an extensive set of observational and experimental data." In addition to Casey and Reichmuth, the coauthors of the paper include Isabelle Charrier of the University of Paris Sud and Nicolas Mathevon of the University of Lyon/Saint-Etienne. This research was supported in part by the U.S. Office of Naval Research, the French National Center for Scientific Research (CNRS), and the University of Lyon/Saint-Etienne.